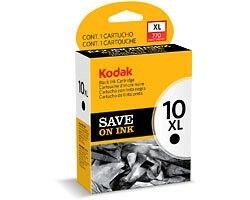 Kodak No 10 / 10b Black cartridge for the above Kodak printers. Also the Kodak 5100, ESP7, ESP9, ESP 5250, ESP 7250, ESP Office 6150. According to the Kodak web site this cartridge can do around 425 pages based on the ISO/IEC 24711 standard. Actual yield results may vary.